Questioner: My difficulty is this. As I can see, every experience is its own reality. It is there — experienced. The moment I question it and ask to whom it happens, who is the observer and so on, the experience is over and all I can investigate is only the memory of it. I just cannot investigate the living moment — the now. My awareness is of the past, not of the present. When I am aware, I do not really live in the now, but only in the past. Can there really be an awareness of the present? Maharaj: What you are describing is not awareness at all, but only thinking about the experience. True awareness (samvid) is a state of pure witnessing, without the least attempt to do anything about the event witnessed. Your thoughts and feelings, words and actions may also be a part of the event; you watch all unconcerned in the full light of clarity and understanding. You understand precisely what is going on, because it does not affect you. It may seem to be an attitude of cold aloofness, but it is not really so. Once you are in it, you will find that you love what you see, whatever may be its nature. This choiceless love is the touchstone of awareness. If it is not there, you are merely interested — for some personal reasons. Q: As long as there are pain and pleasure, one is bound to be interested. M: And as long as one is conscious, there will be pain and pleasure. You cannot fight pain and pleasure on the level of consciousness. To go beyond them you must go beyond consciousness, which is possible only when you look at consciousness as something that happens to you and not in you, as something external, alien, superimposed. Then, suddenly you are free of consciousness, really alone, with nothing to intrude. And that is your true state. Consciousness is an itching rash that makes you scratch. Of course, you cannot step out of consciousness for the very idea of stepping out is in consciousness. But if you learn to look at your consciousness as a sort of fever, personal and private, in which you are enclosed like a chick in its shell, out of this very attitude will come the crisis which will break the shell. Well that’s really odd. I thought your Consciousness was that last reality. Not so? Or is the word Consciousness here used to describe the same thing meant by mind in other texts? 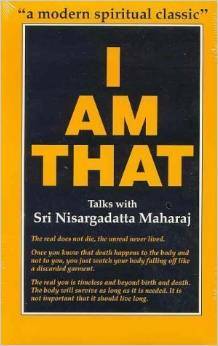 exactly so Bobi, Nisargadatta likes to use Awareness where others might use Consciousness. It’s a good heads up that we always have to understand what the word in each particular usage is referring to. cheers! I am a blogger dedicated to share what Alexandre says. Alexandre is what is called nowadays a modern mystic, although he declines every and any kind of definition. The “standpoint” from where he speaks gives him the authority to affirm so vehemently what he says, and we can feel it… sometimes he is tender, other funny, many very patient, but he can also be very direct and “cut the crap” kind of way. He partakes his view with others, with no other interest than sharing his point of view. The published texts presented in the blog are transcribed from recorded talks with Alexandre and a close group of friends with whom he partakes his discoveries. Some other texts are written words from Alexandre.